A Modern Country Escape - from drab to fab! I have been very quiet on the blogging front as of late - my two little twinnies keep me very busy and I don't want to miss a moment of watching them bloom and grow. So my darling blog has taken a back seat. It feels good to be back here today though! I loved my regular Feature Friday house stalking posts and I do miss them (I hope you do too! ), so even though its not Friday, I was just too excited and have to share this beautiful home with you. My sister Serena has a fabulous eye for detail, style and a wonderful knack for seeing the potential in something and carrying through with her vision. 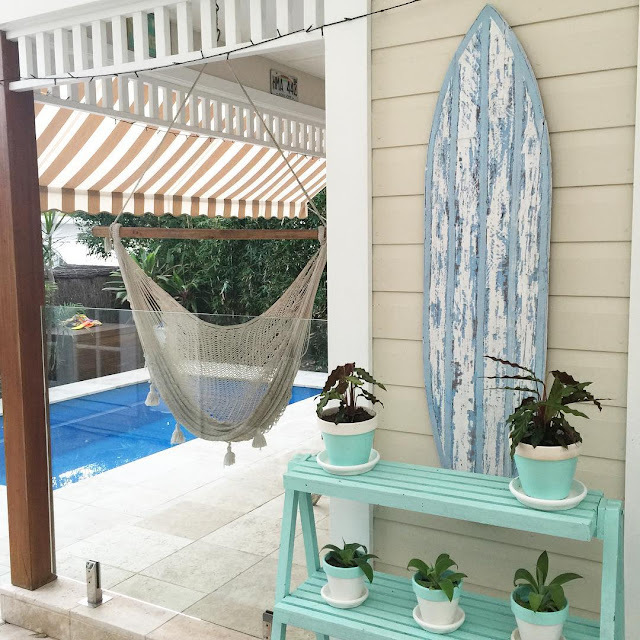 You may remember her Palm Beach home I featured here on the blog in 2014. Well she is now onto her third and hopefully final renovation. 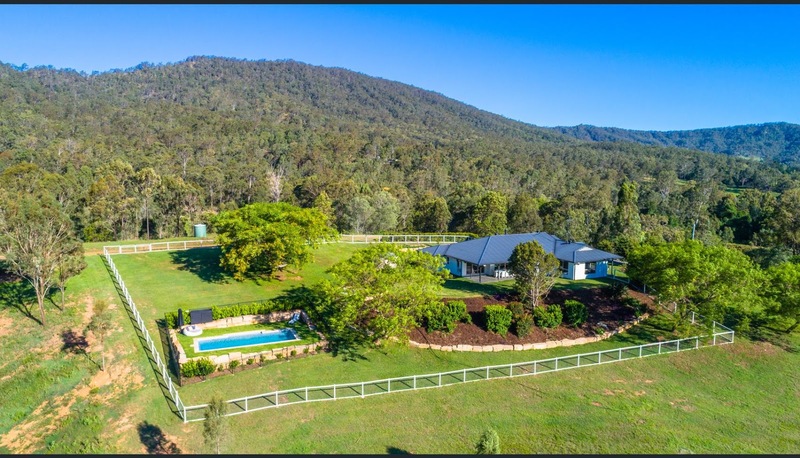 A beautiful sprawling modern home in the Gold Coast hinterland. From drab to fab - a sprawling modernised farmhouse that is virtually unrecognisable from its former state! 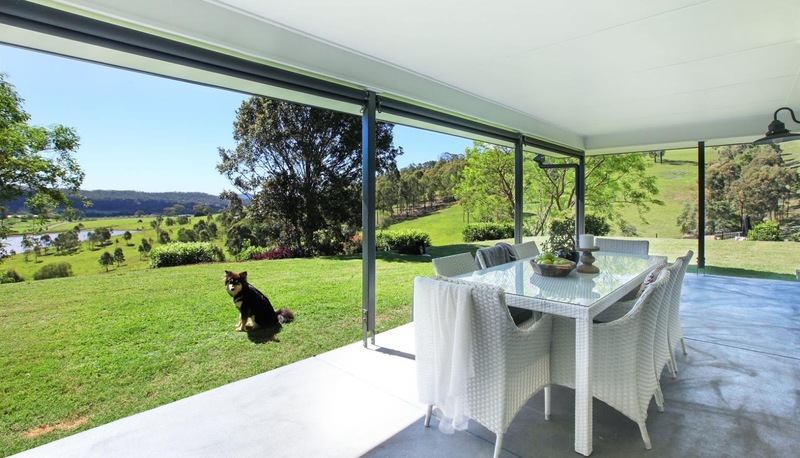 The home is a beautiful retreat, with its luxurious kitchen, bathrooms and sweeping views. With a beautiful 160 hectare block, she feel in love with the valley views and peacefulness. The house though, was not what they wanted. After moving in, they put a pool in, but didn't start the renovations until a year later. A smart move! It gave them time to ponder on their ideas and plans and perfect it, before jumping into it. BEFORE & AFTER The living and dining room is a perfect twist of modern, industrial farmhouse. 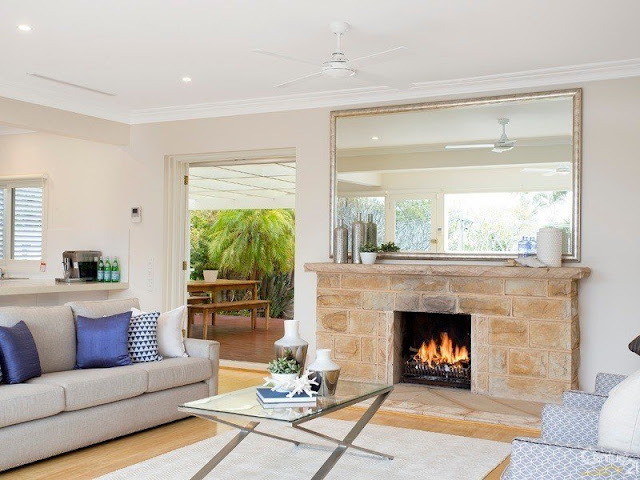 With a grey washed timber look floor, warm fireplace, black accents and timber furniture, its relaxed and homely. This is the second time Serena has chosen to work with James Kitchens, also referring me to the wonderful team and they did my new kitchen just recently! 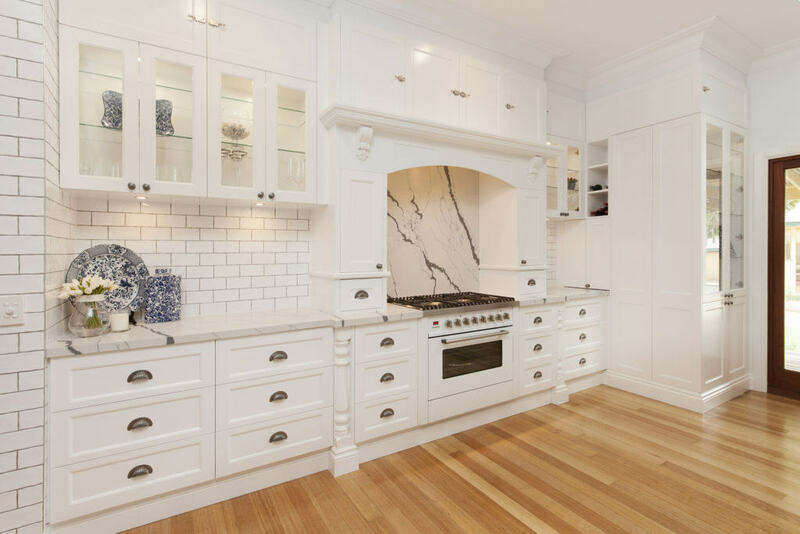 They totally nailed the brief Serena gave them, with classic shaker cabinetry, a prep pantry, extensive walk in butlers pantry and lots of smart storage. Which we all know is so important in a kitchen - you can never have enough! How fabulous does the black Belling oven look? I am so glad she chose a classic black, it just sets off this room I feel. The master bedroom before and after - how inviting and divine is the simple palette? How amazing would the hinterland views be to wake up to each morning. From every window and door in the home, there is a beautiful outlook. The main bathroom is similar to the ensuite, but features a luxurious free standing bath and views out over the ridgeline. The pool area is something special. With so much land, they decided to install the pool a little further from the outside entertaining area to show the opulence of space and not crowd the home. 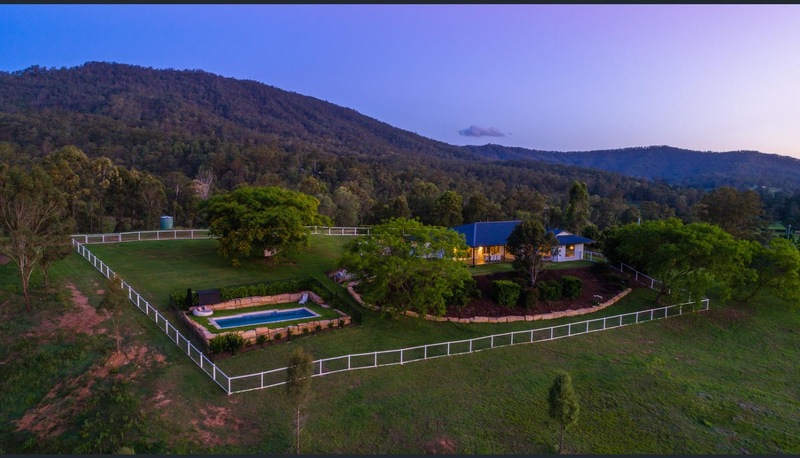 With over 160 hectares, it would have looked very bizarre I think to have it squished right up at the back door step as you do see with many residential homes that don't have the luxury of this space. I am partial to a hanging chair and the one that hangs by the front door here is a beauty - it overlooks the drive and is the perfect place to catch the afternoon breeze. A hanging chair is on my wishlist for my new home! 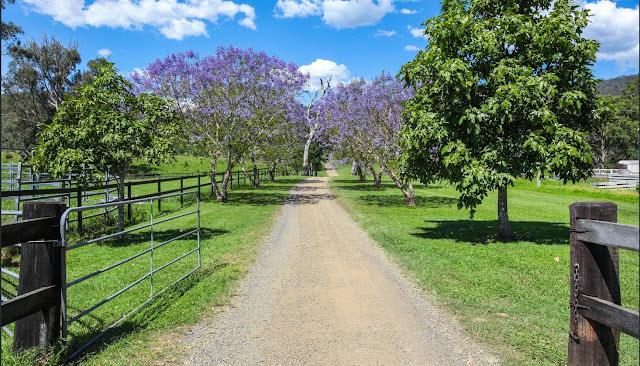 A jacaranda lined driveway...ahhhh this is what country house dreams are made of. Could it get any more perfect? Imagine driving home through that sea of rich purple! Outside is truly spectacular too. Not only have they spent alot of time and energy into making inside look fabulous, but they have spent considerable time outside too. They have spent many months clearing sections of land and opening up the escarpment and views. What was a very scrubby block is now green rolling hills and only established trees. It is postcard worthy! A birds eye view of the 'house yard' as they call it when living rurally. 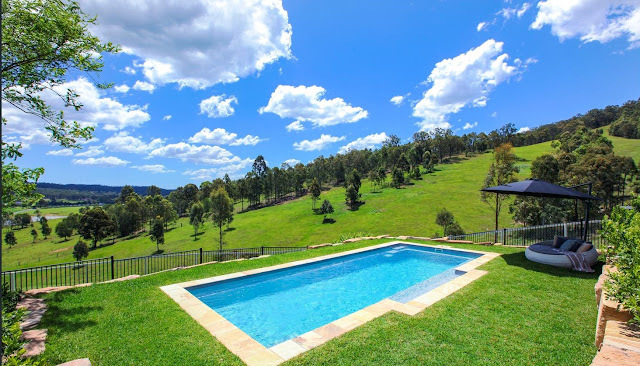 The great Australian dream, a white picket fence, pool and lots of room for the dog and kids. It truly is the perfect country oasis. 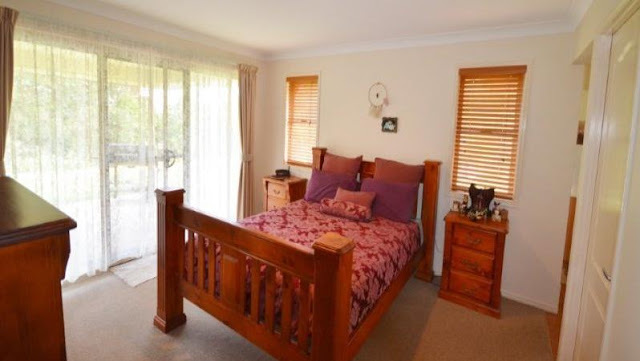 When I visit, the peacefulness captures you straight away and how homely Serena has made the house feel. The warm throw rugs, textured rugs and cushions - it all is the most wonderful combination and makes you feel so welcomed when inside. She has done an incredible job styling it and following through with her vision and the potential she knew the home had. The home and renovation has really created quite a stir and Serena and her husband were recently featured in The Gold Coast Bulletin sharing their renovation stories and tips. So exciting! Paint colour? Flooring? Tiles? Appliances? Styling? Do leave a comment below, I know Serena would be so chuffed to hear from you and happy to tell you more. I have been home stalking on a full time basis lately - looking for design and interior ideas for the new home we are building. 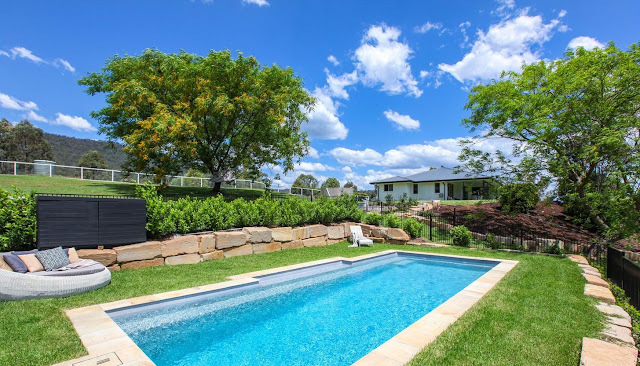 We have designed the home ourselves, taking inspiration from the natural layout of the acre block the home will sit on, the leafy tree surrounds and the aspects of the home. We have kept it light with lots of high ceilings and windows, big stacker doors and all designed around a focal open plan living area. Designing the floorplan yourself is daunting and for most of it, we just winged it - lets home it turns out okay! Thats the thing that is tricky with building, you never know what it will look like, or if there are design flaws until you are living in it and then think 'oh should of added another window there' or wondering if a room needs more storage. So lets hope we have nailed it! When designing the home, we didn't focus on what others are building or designing or whats on trend. We focused on what we love, what is timeless and what works for the block of land and aspects. It is only now, that I am turning to Pinterest more (oh man it is addictive!) and also looking at other builders and what they are designing and doing at the moment. I then stumbled across Metricon's Lookbook page on their website and its brilliant - from high end glamour looking interiors, to a natural Scandi look, Hamptons or vintage, there is a home and lookbook for all! If you’re new to my Feature Friday posts this is where I love to show you inside both real and designer homes. If you’re new to my Feature Friday posts this is where I love to show you inside both real and celebrity homes. Who does the home belong to you ask? Eighteen months after buying this Watson's Bay $6.25 million dollar home, it's on the market. 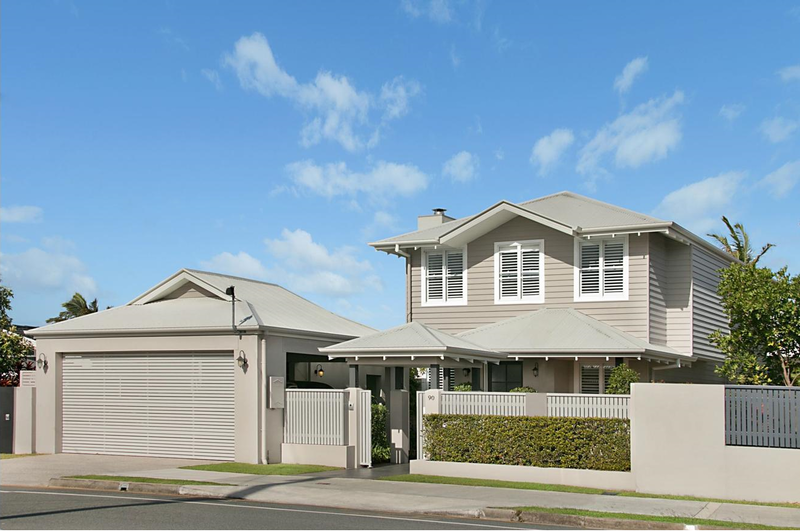 No expenses have been spared on this Sydney home, with Dinnigan renovating elements of the home after buying it. Shortening the pool to add palm trees and a garden (don't they look divine!) and adding extra bedrooms and bathrooms. Its a series of eclectic, feminine spaces with French details. It is the details though that are Dinnigan's signature style - the detailed bed linen, intriguing art and furniture. Hello! If you’re new to my Feature Friday posts this is where I love to show you inside real homes. 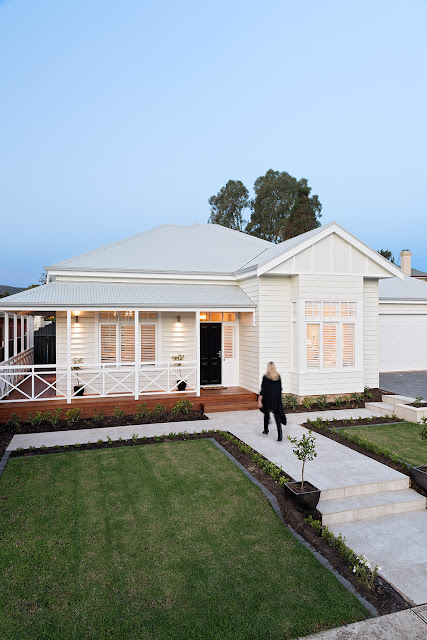 Today's home tour, is a home in my local neighbourhood. If you are a Gold Coast local, you might know it too? 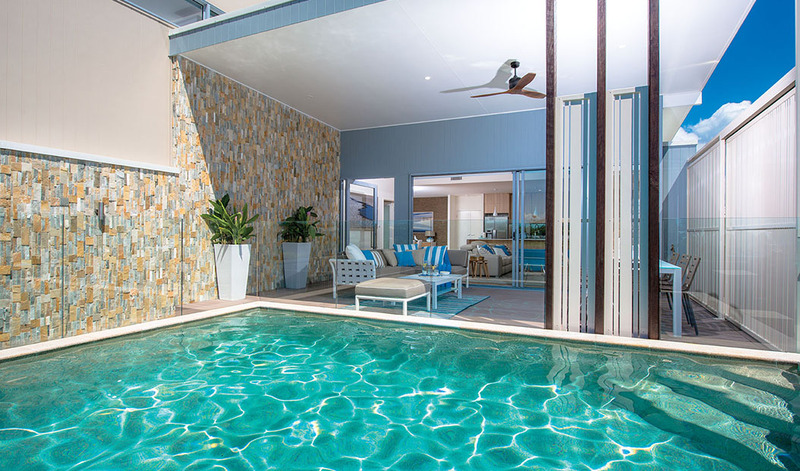 There was a block of land that was nestled alongside the waterfront homes of Queensland's Palm Beach. 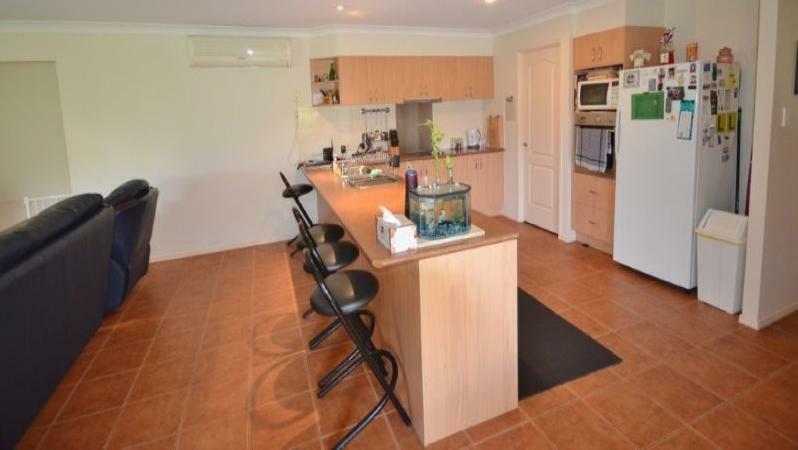 Right on the stunning Tallebudgera creek, its a beautiful waterfront location. It was recently bought and this stunning Hampton's home was built. It has recently been listed for sale and was turned in at Auction, now for sale for $1,490,000. Hello! If you’re new to my Feature Friday posts this is where I love to show you inside real homes. Today's home tour, is the perfect marriage of old meets new. A little slice of the Hamptons in metropolitan Melbourne. That's how the former owners of this home, The Blocks Julie and Sasha describe their home which they recently renovated and sold in Elsternwick. The home sold to reality TV's The Bachelor couple, Sam & Snez for a cool $1.6 million. Hello! If you’re new to my Feature Friday posts this is where I love to show you inside real homes. I know you are going to love this home i am sharing with you today. 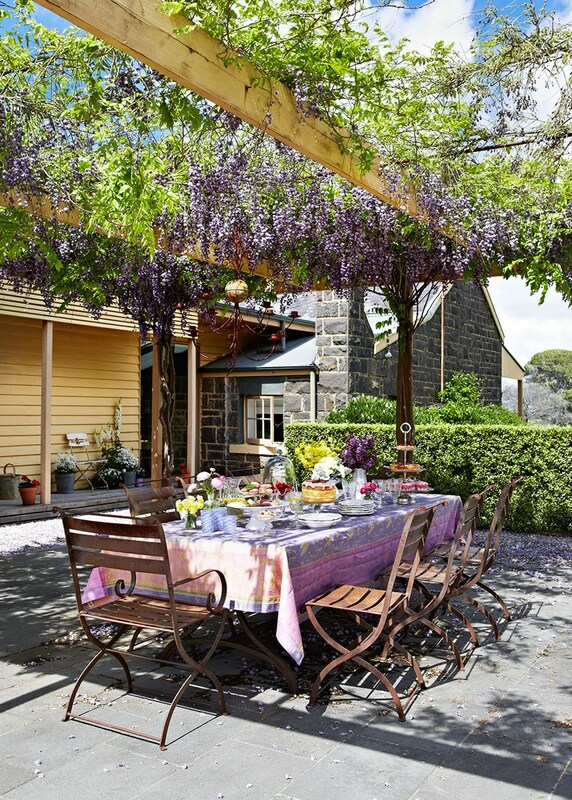 A home oozing with old-world charm, with blossoming wisteria and elegance. This is the home of Catriona Rowntree. Hello! If you’re new to my Feature Friday posts this is where I love to show you inside real homes. I know you are going to love this home, it's full of love, charm and character. 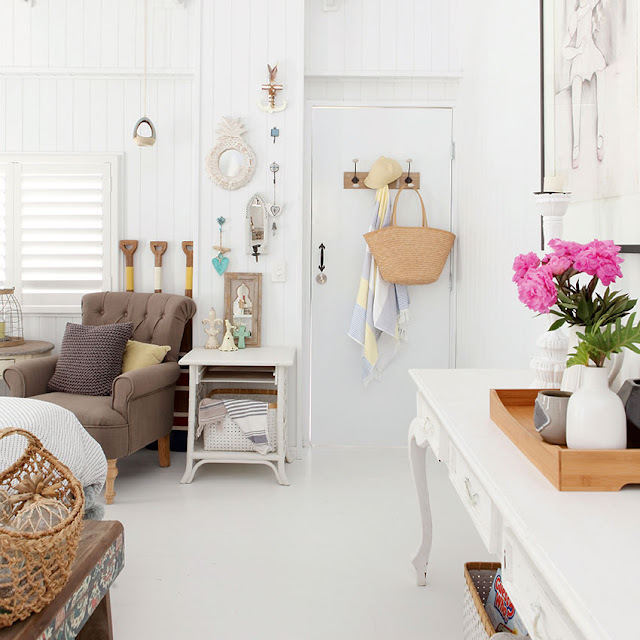 Jacqui lives the coastal life in Newcastle, Australia with her family and super cute pooch in their beautiful Hampton's inspired home. Jacqui busies herself with teaching and her design and styling services at East Coast Living, helping you create a relaxed and beautiful home. Jacqui was so kind to share her home with you all today and a little bit about her and her life. You may recognise Jacqui from Instagram? She has a loyal following, of fellow coastal home loving enthusiasts. 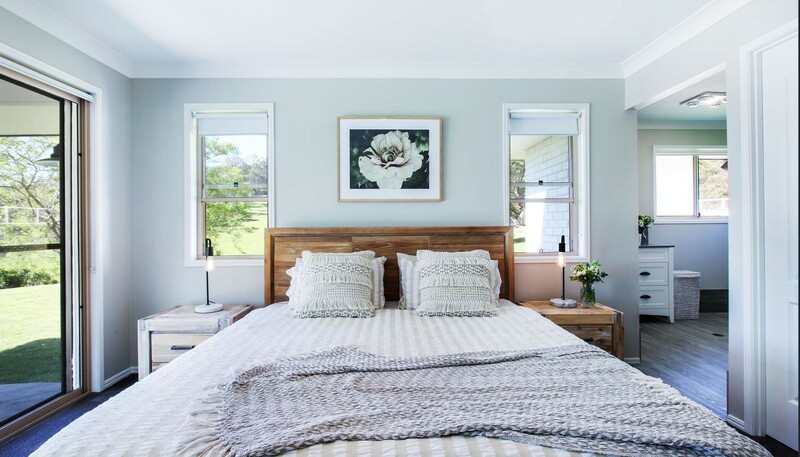 Renown for her coastal colour palette, shades of sea greens and blues and knack for putting together beautiful vignettes and styling rooms of her home. Hello! If you’re new to my Feature Friday posts this is where I love to take you for a home tour. Today I thought we would pretend for a moment we are salty, sunned out and relaxing on the hilltop of this South African beauty. We can only dream right? 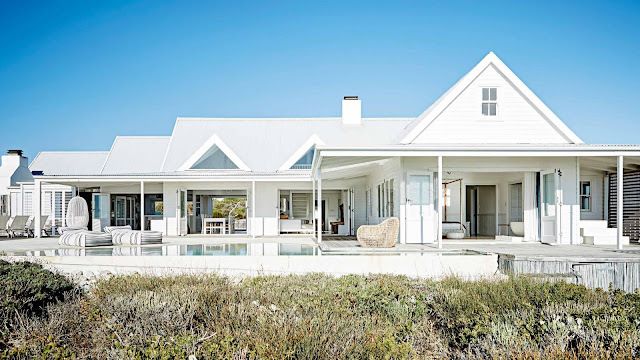 When I came across this South African Beach House it transported me to instant holiday mode. A home designed to take in the beautiful ocean view from every aspect. Hello! If you’re new to my Feature Friday posts this is where I love to show you inside real and celebrity homes. 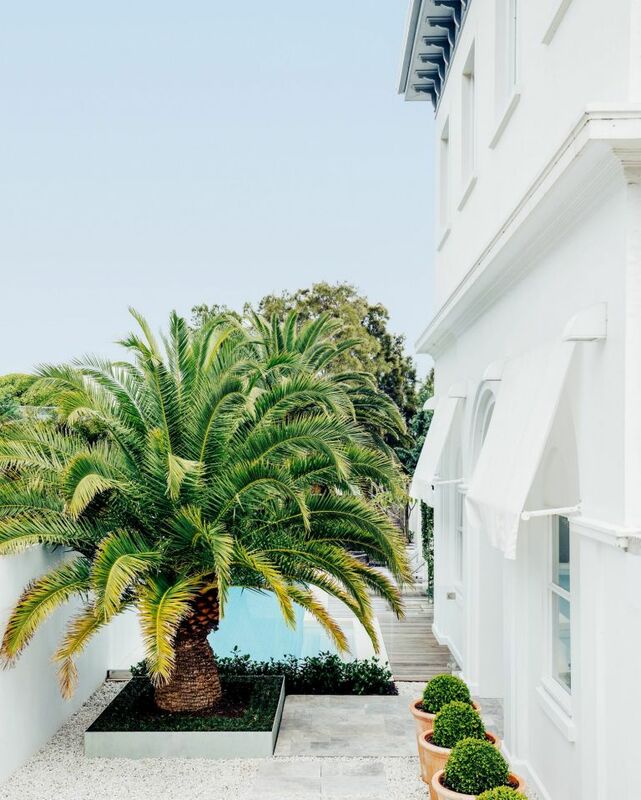 Today I thought we would take a peek inside Whitney Port's home and also swoon over her wedding photos...they are stunning! Whitney Port may have rose to fame via reality TV on the show The Hills, but there is so much more to this stunning lady - Clothes Designer, Author, TV star and recently her newest title of Wife! Whitney tied the knot last November in Palm Springs and the wedding photos look nothing short of spectacular. Desert, chic, art deco, tropical - it surely is something so different. How incredible is the palm frond arbour at the alter? Hello! If you’re new to my Feature Friday posts this is where I love to show you inside real homes. I know you are going to love this home, it's a home that has been thought about and planned with precision, resulting in a Hamptons meets Edwardian meets Country stunner. This is the the home of Phil and Amity. Phil and Amity are household names after competing in two season of The Block. 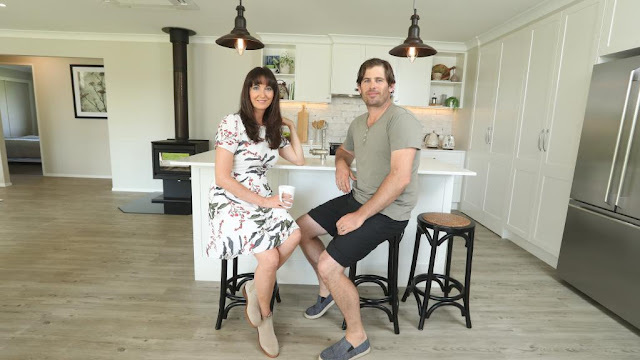 The talented duo reluctantly agreed to the 2013 The Block All Stars series, after not renovating since their last block experience - 10 years before. You wouldn't have known it though. The Husband and Wife team have a serious eye for style and design and were crowned the winners of the All Stars season. There is seriously nothing Amity cannot do. Singer, Writer, Composer and TV Personality, plus Mum to two gorgeous children Jamison and Poppy. Amity's career has taken her as far as New York, Europe and many places in between, performing and doing what she is best at - unleashing her creativity. 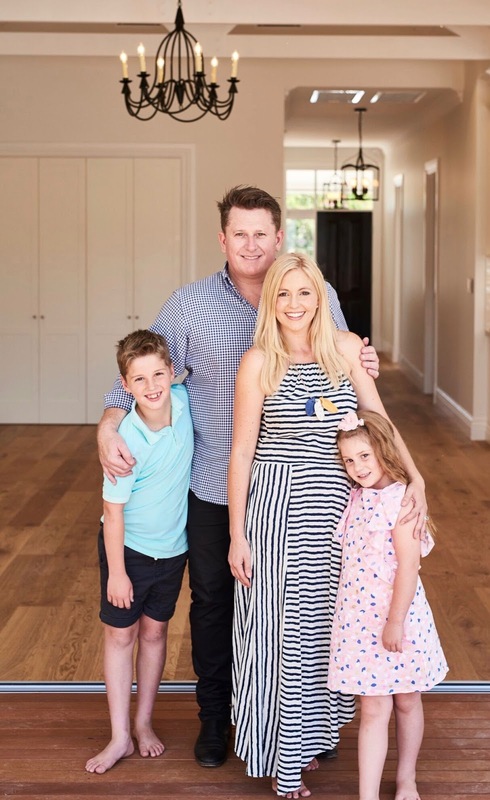 Phil and Amity have just finished building their dream home and Amity was so kind to take the time to chat to me about what they have been up to with their new build. It is a home that Amity has been dreaming of building her whole life and it is nothing short of spectacular. Lets take a look inside shall we? I love seeing a before and after transformation. 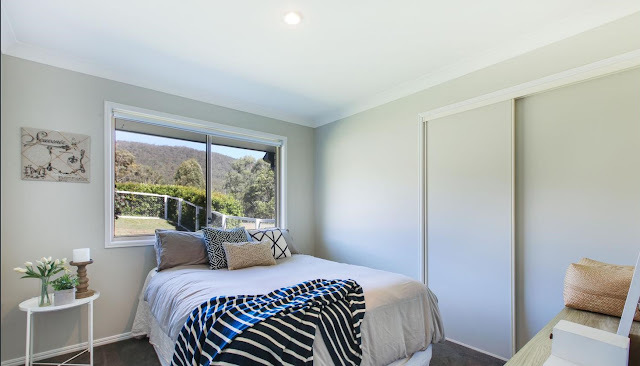 When serial renovator and interior designer Leanne posted on Instagram that she had recently finished renovating her home I wanted to know and see more. In under a year, Leanne and her Husband bought, renovated and are now selling their home in northern Sydney's beachside suburb of Newport. It was the home that no body wanted, the house in the best street and location that needed some TLC, that they snatched up at auction last July. In this time, blood, sweat and tears have been shed as they transformed this tired 1980's brick home to a coastal, open plan retreat. 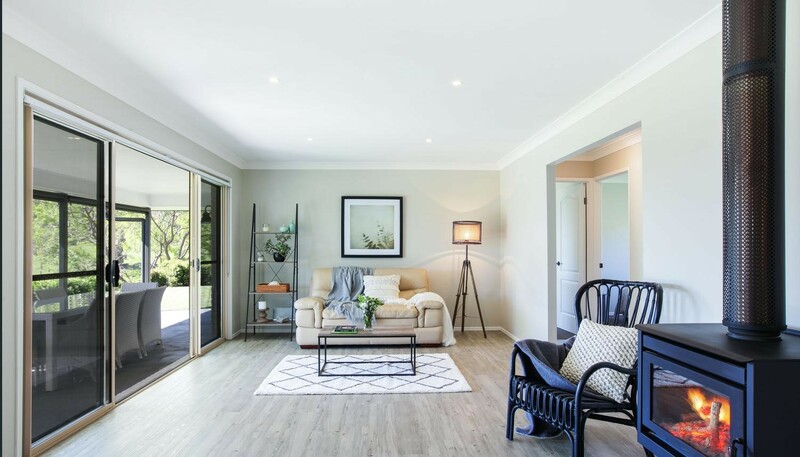 With five bedrooms and three bathrooms, two living areas and numerous outdoor living and entertaining spaces this home would have been a massive project to tackle and transform. But today you will see for yourself, the amazing transformation and perhaps learn a thing or two from this serial renovating duo! Home and life on the road - the adventure that never ends. 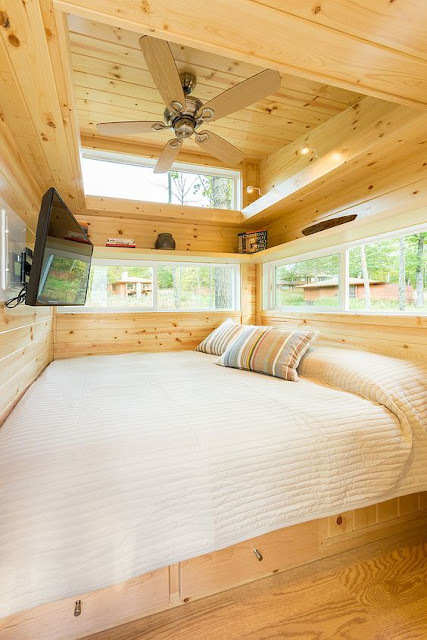 Would you live life on the road? My Mum is currently doing the retired grey nomad thing. She left the Gold Coast in February, heading south to explore the coastline of NSW, VIC and SA, before heading up into the dessert as the weather turned cooler. She has been living life in a motorhome and plans to do so for nine months of this year. She will be home for Christmas and no doubt will have stories to tell! It is something she has always wanted to do, explore this great big beautiful land of ours. I am so glad she is doing it and living that dream. One thing that she found hard though was downsizing, to fit life inside four walls and learn to live compactly! I thought it might be a little fun to do something differently today for Feature Friday and show you how people live life on the road, instead of traditional brick and mortar homes. 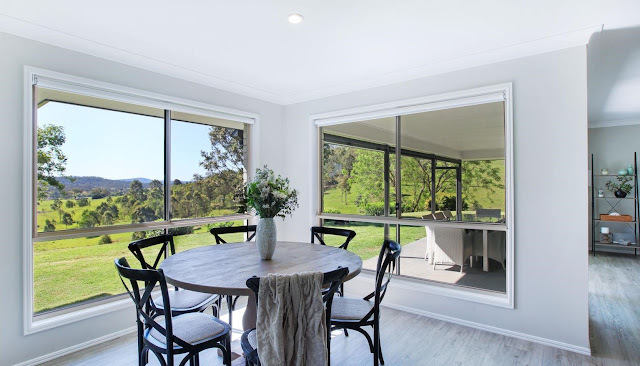 Welcome back for another Feature Friday post, if you are new around here, each Friday I love to take you on tour through real homes, celebrity homes and homes that we can only all dream about. Today is no different! 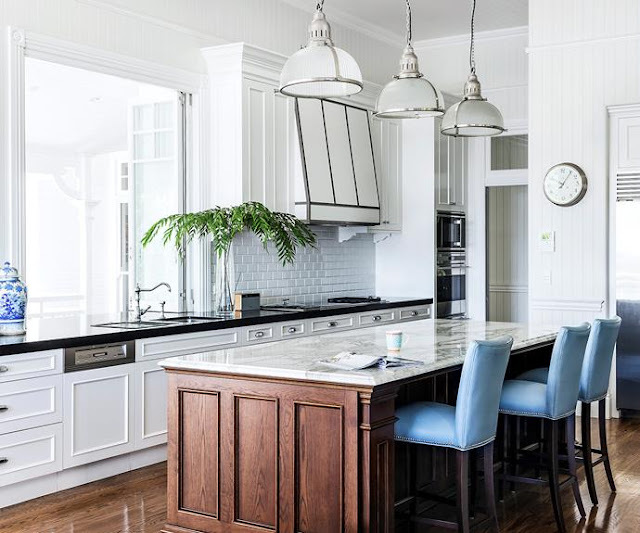 Have you ever thought of renovating your kitchen to a dreamy Hamptons style? 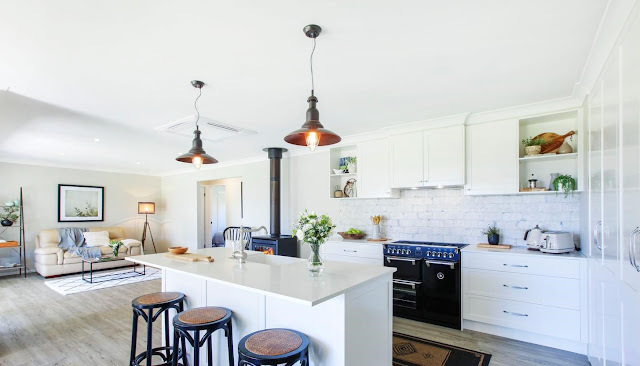 Meet Danni - today she will be inspiring us all with her newly renovated Hampton's kitchen and sharing some of her design and renovation tips. The stunningly stylish Danni, who is an Interior Stylist has turned a dull and lifeless kitchen into something so beautiful, I know I could spend hours in there - running your hands along the stunning cabinetry, subway tiles and admiring the marble look features. 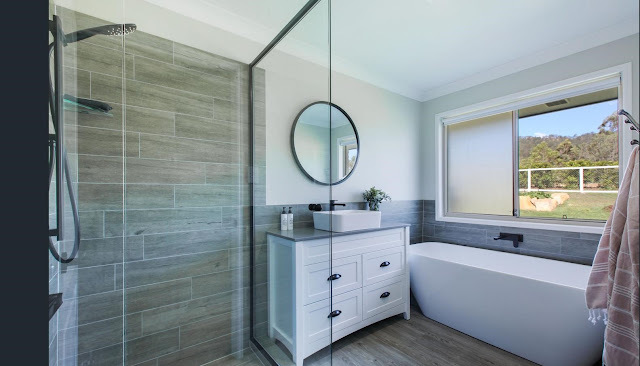 It is breathtakingly beautiful and also recently featured in Queensland Kitchen + Bathroom Magazine! Danni has recently purchased a home with 'good bones' as we say on Queensland's Sunshine Coast - with huge grounds, hardwood floors, high ceilings and an unbeatable location. 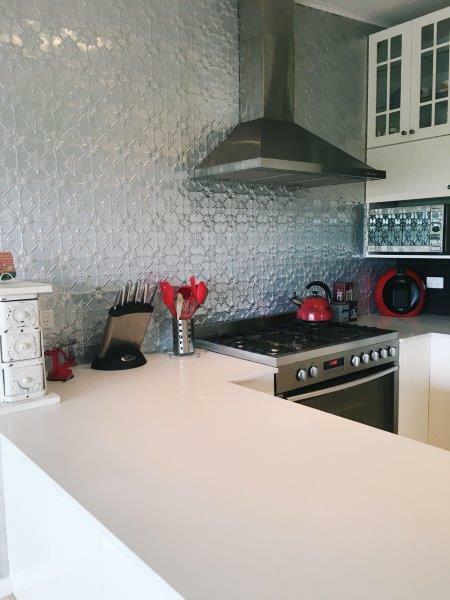 Her kitchen renovation is one of many projects she will be tackling as she maker her new house her dream home. I caught the end of some footage on morning TV this week, of Bec and Chris Judd's Melbourne home. It certainly was impressive and I thought you might too want to take a look? You will find the Judd's living in the beachside Melbourne suburb of Brighton, with their two children (with twins on the way!). Perfectly styled, you would not be mistaken to think Bec is an interior Designer. You must know by now I am a massive home stalker! Each week I bring you a new home tour and love showing you inside real homes! 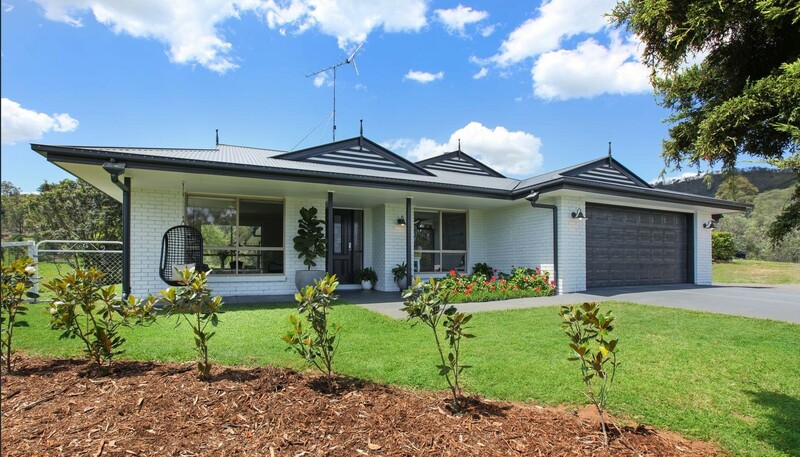 I have been known to go and sticky beak at open houses and I do love going through prize homes on the weekend. Seeing floorplans, layouts and furnishings excite me! I thought I would show you today the new yourtown prize home at the Sunshine Coast. 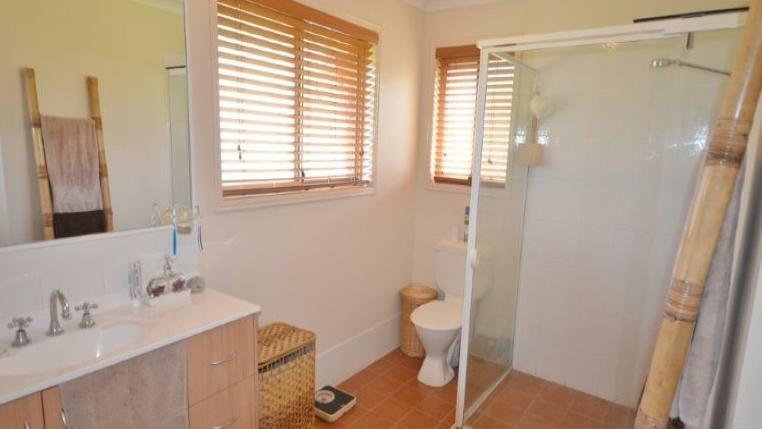 Queenslander homes are so grand aren't they? 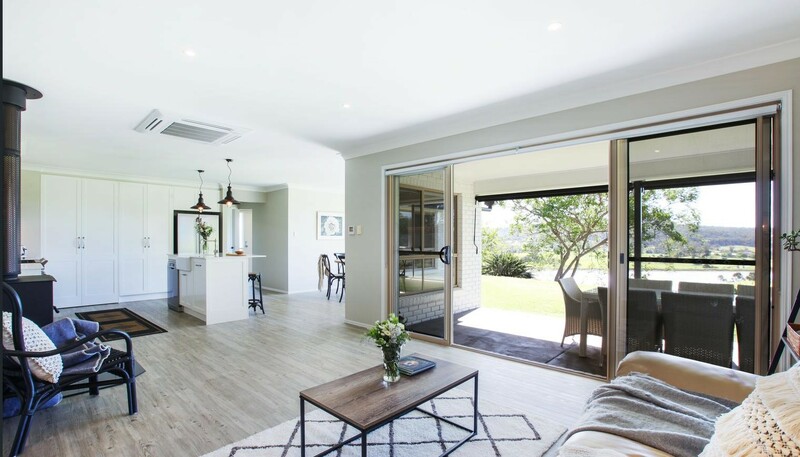 Located in Brisbane's inner north, this Queenslander family home was once a small home, which had a large extension recently added to it. People often say to live in a home before renovating it. To get a feel for the breeze, light, aspects and of course know the home in and out throughout the seasons. The owners of this home waited ten years before renovating, in that time the family of five, outgrew the original modest home that stood on the block. When this home popped up in my facebook news feed thanks to Homes To Love, I immediately wanted to see more and I know you do too. As it's Feature Friday Home Tour day, lets take a look inside shall we? It is clear that the Real Housewives of Melbourne star Chyka Keebaugh is house proud. With a natural flair for making everything look and feel beautiful - Chyka is one of the most sought after event stylists and planners in Australia. 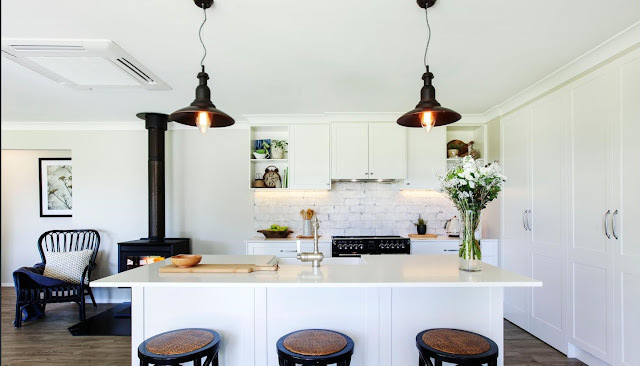 From the photos of her home tour I am sharing with you today you will see why. 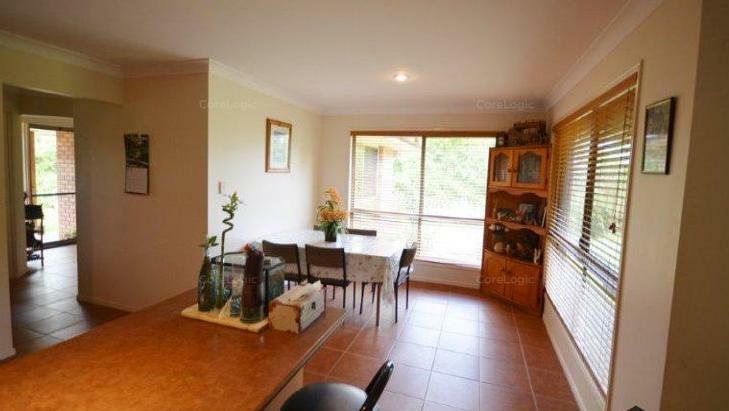 A manor style abode, this three bedroom, four bathroom home, plus a granny flat is impeccable. Organised, colour coordinated (you should see Chyka's wardrobe!) and effortlessly elegant, it is a home that I know you will love to see inside of. Alongside husband Bruce, Chyka owns The Big Group, one of Australia’s largest privately owned catering and event-management companies. 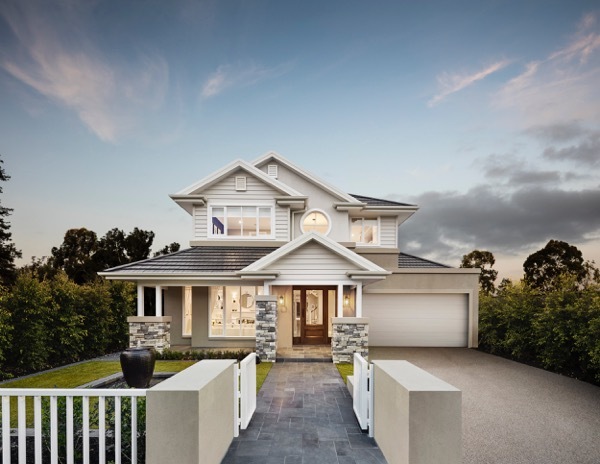 Hard work has clearly led to success, with them residing in the home of their dreams in Melbourne's eastern suburbs. Today I am delighted to introduce you to Eva. Eva is the editor of her own blog, The Multitasking Woman offering inspired living for the everyday multitasking woman. Eva shares fabulous posts on motherhood, stress free living, health, relationships, career and living, such as Top Tips for Moving House, Parenting Taboos, Suffering from Busyness (yes it really is a thing!). Eva is also a freelance writer, digital campaigns manager for a parenting magazine. When Eva isn't lost in words in her digital space, she enjoys spending time with her family, reading her favourite magazines and gardening. I shared a post on Facebook one day about an Ikea Kitchen and Eva piped up that she had recently installed an Ikea kitchen in her home. 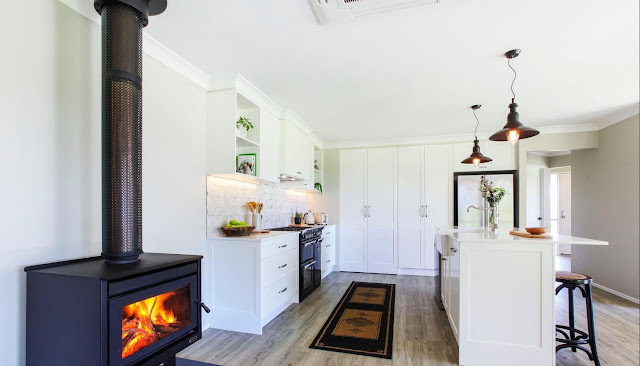 Eva was so kind to take some photos and let us step inside her home and so, here we are, its Feature Friday home tour time once more and this week, we are stepping inside Eva's 100 year old workers cottage. Megan Gale listed her Palm Beach home on the market last October and still the water view property has not sold. With a price tag of $3.5 million dollars, just a little more than she paid in 2006 when she purchased the home for $3.2 million dollars. 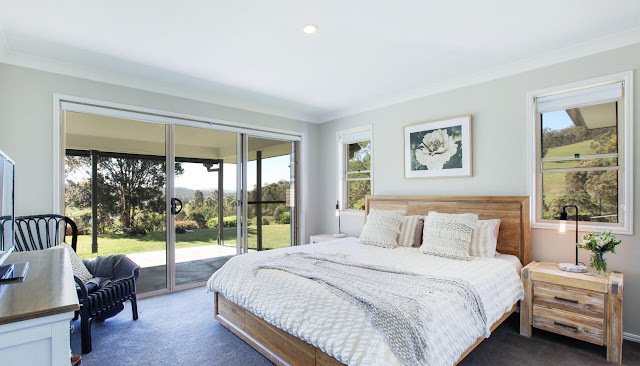 With Megan now residing in Melbourne with her AFL star boyfriend, she has obviously decided it was time to cut ties with her Northern Beaches home at Palm Beach - famously known for being Home and Away's 'Summer Bay' location. Ever thought of doing a garage conversion? 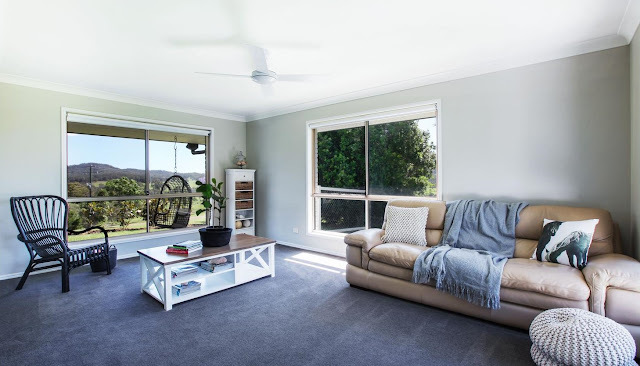 I came across this incredible transformation of a Sunshine Coast garage today and thought I would share it with you for today's Feature Friday post. 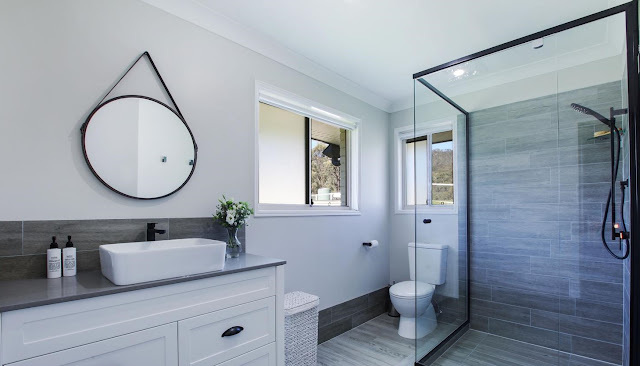 A growing Sunshine Coast family were wanting a place that family and friends could stay, complete with its own bathroom and kitchenette. A place guests can have their own space and come and go as they wish. They converted their garage to the guest house and have no regrets - it looks incredible!